Our selection of acrylic jewelry displays will enhance the numerous colors of any/all attractive jewelry products, such as; stone jewelry, crystals, and red ruby rings or jade bracelets. In addition to the acrylic jewelry displays, we also carry, the light boxes to accent the speciality jewelry items, rotating jewelry units and much more. In case you do not see a particular item listed or shown on our website: please call our office; e-mail or fax any inquiries; and last but not least - come visit our showroom to view our entire line of merchandise. This cradle-type bracelet display features a removable rod. Easily assembled allowing them to be manually turned to view hanging necklaces. Tops and bases detach for each shipping. The two joined hearts with two ring clips attached to the top. An ideal display for weddng sets or engagement/wedding band combinations. This spinner rack holds a total of 72 two-inch cards. Base and the top come in black acrylic, ladders are available in either clear or black. The ladder style earring card display sits on a 9" diameter lazy susan base. There are 9 ladder-style bars; each bar is capable of holding four 2" cards or two 2.5" or 3" cards. This locking style case holds 70 two-inch jewelry cards; with mirrored acrylic side pieces which accent this display. This locking unit has doors on either side and includes cam locks and keys. 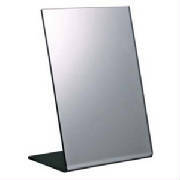 Acrylic mirrors border the top of these white or frosted acrylic displays on a white lazy susan base. This multi-necklace display is versatile and allows for several necklaces to be displayed. This displays a pair of earrings or earrings and a necklace together. Show a single ring - solid tapered display. This unit holds a total of 108 two-inch display cards. The base and top come in black acrylic, ladders are available in clear or black. The ladder style earring card displays are on a 9-inch diameter lazy susan base. The popular display may be used for either earring or other jewelry cards and have a a ladder-style bar with 9 bars each. The bars will hold four 2" cards or two 2.5" or 3" cards. The above picture shows three different models, we only carry the 'double rotating' style,which is the first example. Inserts are made of black acrylic with J-bar attached for 1.5" long slide on hooks; also may be used without hooks for jewelry cards. Counter-top card display with J-bar attachment may be used with or without J-bar hooks. This counter-top displays with J-bar attachments may be used with or without J-bar hooks, as the smaller unit. Beveled polished edges; counter sizes available. This round "T" bar display is made with end-caps on the bars to prevent jewelry from slipping off. Perfect for long necklace displays. This is a multi-necklace display. The earring display shows off one pair or two small pair of earrings; or matching post and dangle sets. These rings clips aer attached to squares of .25 inch thick polished acrylic to give extra stability for large rings. This unit holds a total of 144 two-inch cards. All turning ladder style earring card displays are on a 9" diameter lazy susan base. This unit may be used for other jewelry cards and holds either four 2" cards or two 2.5" or 3" cards. For a different look this vertical display of open trays with a partial or locking security. This all acrylic case is excellent for displaying standard 1" and 1.5" open trays for earrings, rings, etc. This case has a hinged door on the back with a lock and two keys. Two open trays may be displayed within this case; with the back tray at a 45° angle for good viewing. A separate cover slides over the case and has a lock hasp in the back. Usable for standard 1" and 1.5" - high open jewelry trays for rings, earrings and much more. Lock and two keys are included. The black acrylic provides a striking accent to this attractive mirror. ♦Note: Only the Slant-back with black frame is available.